It’s funny, I don’t have children, I am not a student nor a teacher, and still, I get a little sad every time school rolls back around. Must be residual dread 😂 For today’s post, I wanted to focus on something to make your life easier, kids or not. 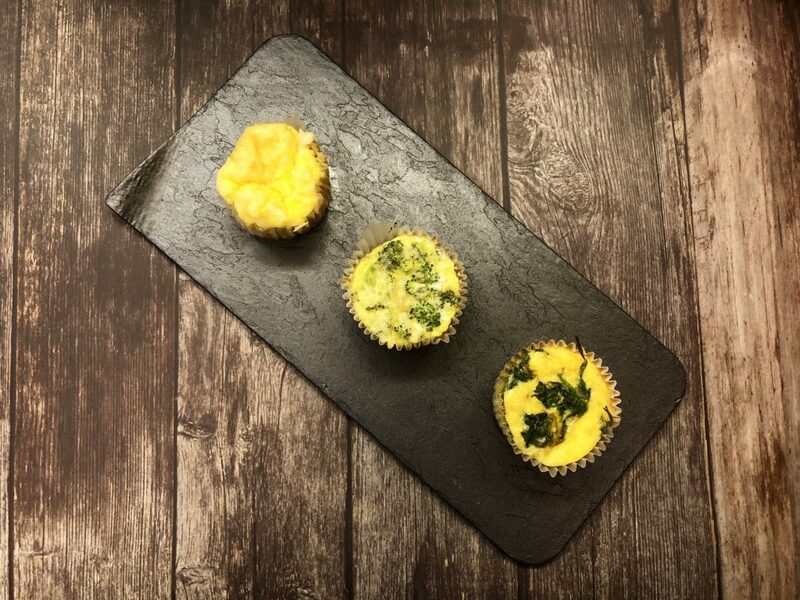 These No Stress Breakfast Egg Muffins are super easy to make, can be made in big batches and individually frozen for make-ahead meal prep, and can be customized to anything you can dream up! What’s not to love?? I put together 3 classic versions of this wholesome breakfast to get you started, but go get creative to make them work for your family! Preheat the oven to 375 degrees. 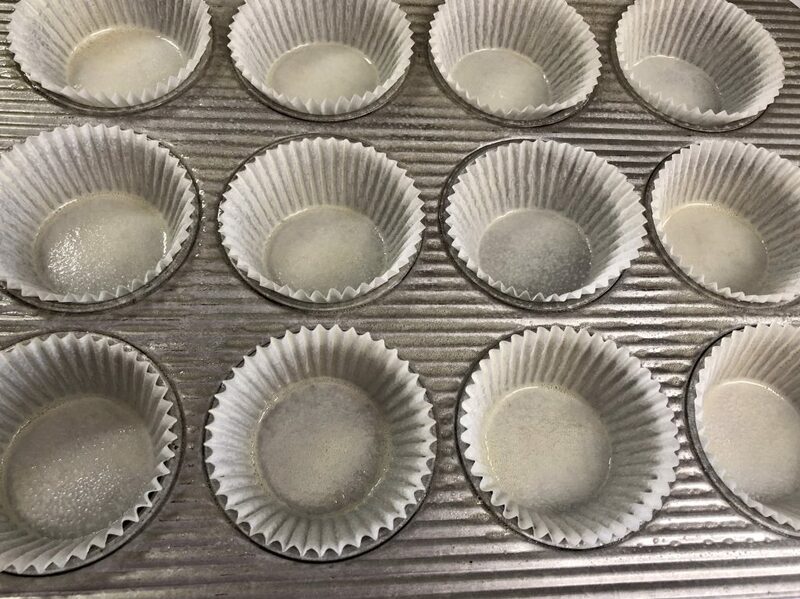 Spray a 12 cup muffin tin with cooking spray or line with paper muffin liners and then spray. These like to stick to the pan, so don’t skimp! Set aside. NOTE: If you are planning on microwaving these later, make sure NOT to use aluminum liners. In a large bowl, whisk the Base ingredients. 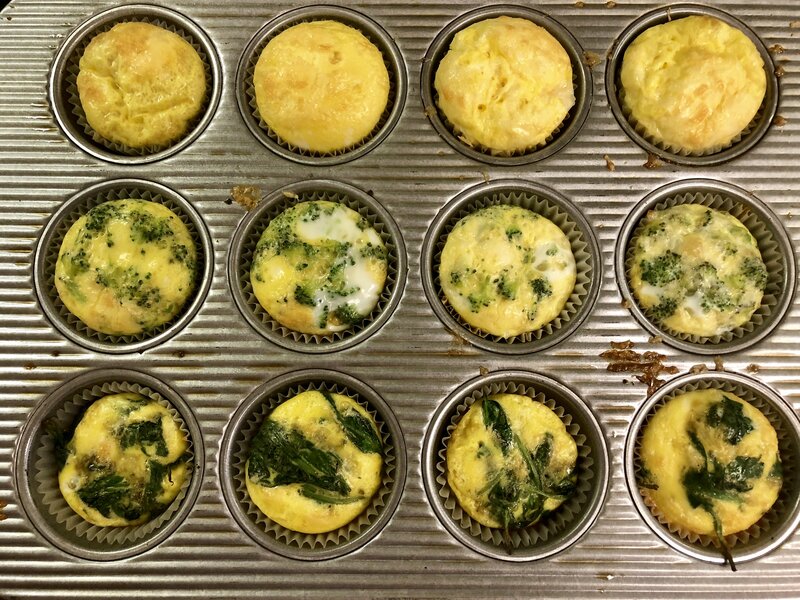 Sprinkle your veggies and cheese (if using) into the muffin cups. If you are trying to hide the veggies in the cups, through them in a blender or food processor before adding to the cups. Evenly pour the mix into the prepared muffin tin (filling each cup approx 2/3 of the way full). Bake for 20 minutes. The egg mixture will be firm and the cheese will be nice and bubbly. Let cool in the pan for 5 minutes and then enjoy! Remove the cooked muffins from the oven and let cool completely. 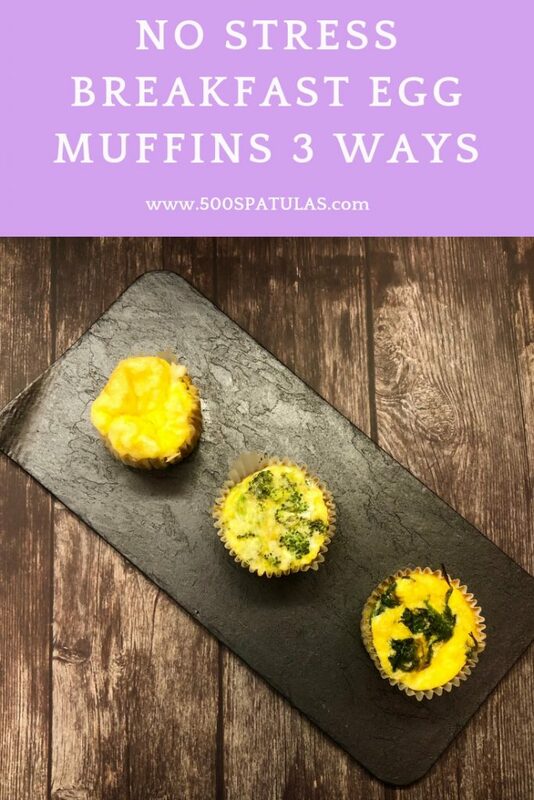 Wrap each muffin individually in plastic wrap and place all of the wrapped muffins in a large ziploc bag and stick it in the freezer. When ready to enjoy, remove the plastic wrap and pop a muffin or two in the microwave for 25 seconds or until heated through. Ready to go! 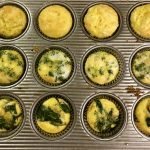 I hope you love these No Stress Breakfast Egg Muffins and can’t wait to hear about your family’s favorite combinations. Preheat the oven to 375 degrees. Spray a 12 cup muffin tin with cooking spray or line with paper muffin liners and then spray. Set aside. NOTE: If you are planning on microwaving these later, do NOT use aluminum liners. 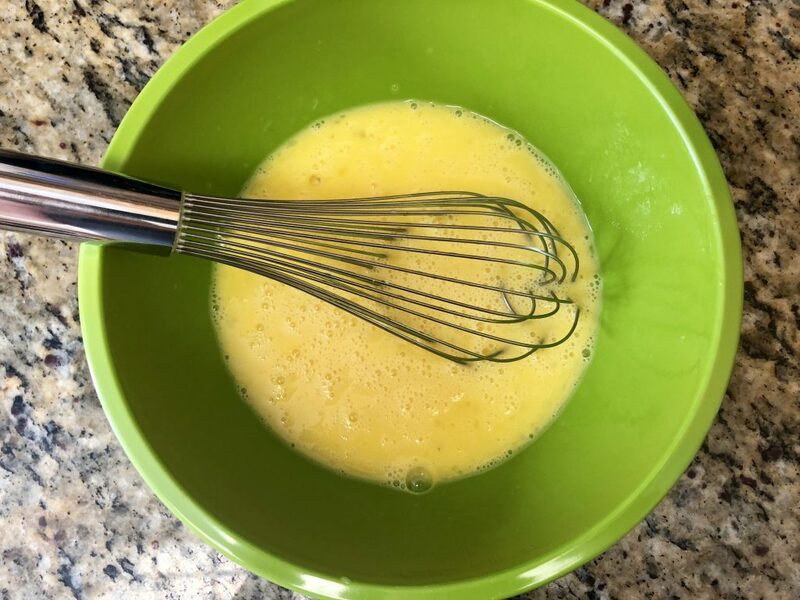 In a mixing bowl, whisk the Base ingredients. 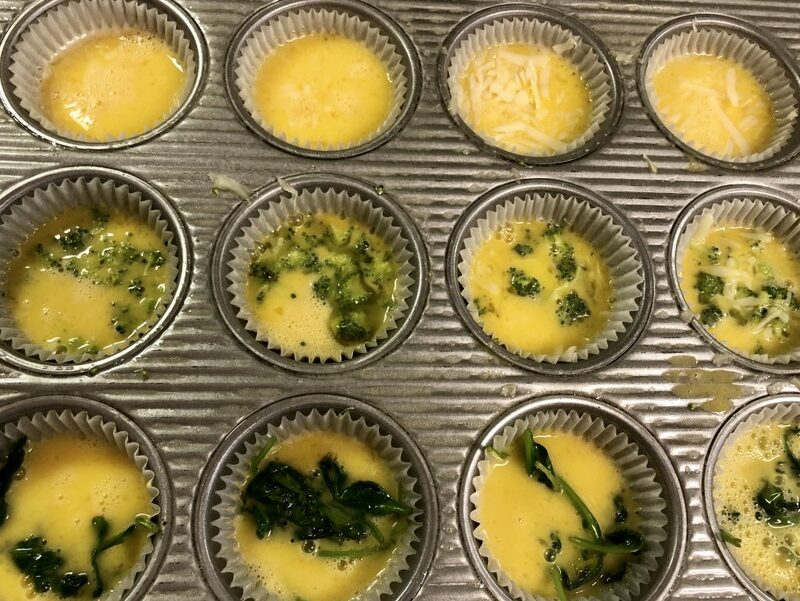 Add your veggies and cheese (if using) to the prepared muffin cups. If you are trying to hide veggies, pulse them in a food processor or blender to make them tiny before adding to the muffin cups. Evenly pour the mix into the prepared muffin tin (filling each cup approximately 2/3 of the way full) and bake for 20 minutes. The egg mixture will be firm and the cheese nice and bubbly. Let cool in pan for 5 minutes and then enjoy!